Over the weekend, Steve and Matt did their best to have an argument about the Battlefield Hardline beta, but failed miserably – both were in agreement that the multiplayer modes on show were cynical rehashes of the established Battlefield formula. Hardline, it seems, wears its cops and robbers conceit like a groucho mask: ready to be tossed aside as soon as the party starts. But maybe there’s more to it than we’ve seen to date. The single player campaign casts players as a dodgy Miami detective with access to a police scanner, which is new. And Visceral’s Thad Sesser says we’ll come to appreciate “fundamental changes” in multiplayer. 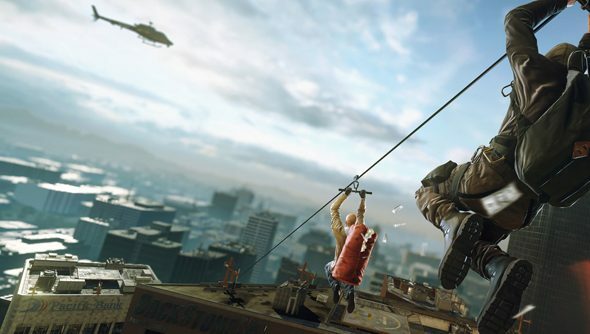 Asked by PlayStation Lifestyle at E3 whether Hardline could have been a Battlefield 4 expansion, lead multiplayer designer Sesser talked up the game’s “slew of new game modes”. “Obviously, we got a wide range of maps. We got a lot more weapons. We got a lot more cool gadgets. We got a lot more exciting stuff to show you in the upcoming weeks and months,” he said. Like Battlefield 4, Hardline makes use of DICE’s Frostbite 3 engine – but Sesser says Visceral haven’t been afraid to tinker with it. And the Hardline team have made some “fundamental changes under the hood”. “In terms of the UI, we still want it to be recognizably Battlefield, but we’ve got some changes, we’re listening to user feedback, we’re always soliciting comments and feedback from the players,” said Sesser. The Battlefield Hardline beta has been open for four days now. So tell us: what’s your take on its military-grade battle between cops and crims?